What Does Your SaneBox Ranking Mean? The idea behind the ranking is to give you points for good email behavior and take away points for bad behavior, and in the process to nudge you to develop better email habits! The core idea behind Getting Things Done is to focus on the most important thing now,and avoid getting distracted by the shiny stuff. You can only do this if you are willing to admit that there are lots of emails that are unimportant. 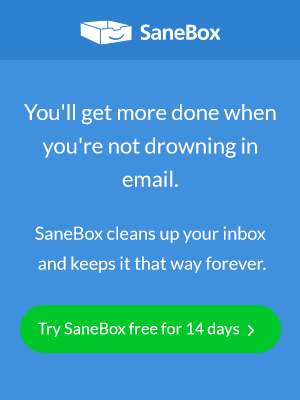 In SaneBox, this means that you get penalized for gratuitously making emails Inbox worthy. 3. Process more email. Sorry those of you who get less email. We are rewarding the heavy lifting that some of our high bandwidth customers are doing. But don’t give up, the other 3 rules can overcome this one. 4. Don’t fidget with your unimportant email. That stuff is unimportant for a reason! If you can’t bear the feeling that you are missing something, have your email digest summary arrive more often.